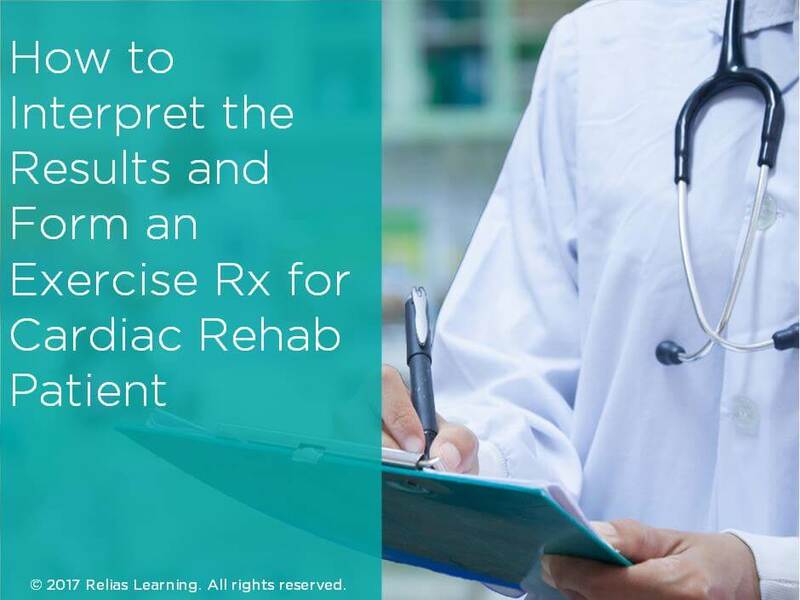 This webinar is designed to assist Cardiac Rehab Professionals develop an EFFECTIVE exercise prescription for their patients. We will review common graded exercise stress test (GXT) protocols and the purpose of these tests. In addition, we will also discuss the data that is collected and interpret that data obtained. Finally, we will apply the information we obtain in our GXT’s to our exercise prescription. We will utilize basic principles of exercise prescription for populations with or without GXT results. This course has been approved by the Florida Board of Occupational Therapy for 1.00 contact hours, approval number 20-587837. This course has been approved by the Alabama State Board of Occupational Therapy for 1.00 contact hours, approval number 20-587837. Oklahoma Physical Therapy Advisory Committee has approved this course under Category B. Approval # 201910314. This activity is approved for 1.00 contact hours. This course is approved by the Ohio Physical Therapy Association, approval number 18S7762. This activity is approved for 1.00 contact hours. Identify 3 reasons why stress tests are performed on cardiac patients. Calculate appropriate target heart rates for cardiac patients. Identify 3 different methods of determining target heart rates for cardiac patients. Identify 3 common stress test protocols used on cardiac patients. Ms. McCloskey is an American College of Sports Medicine (ACSM) Registered Clinical Exercise Physiologist and ACSM Certified Exercise Specialist. She has been employed as an exercise physiologist in a Cardiopulmonary Rehabilitation Department for the last 17 years, working extensively with a large variety of patient populations. Her clinical background also includes serving as an exercise physiologist in the following areas: Community Health Education Department, Health and Wellness Department, Fit City, Bariatric Department, and the Center for Parkinson’s. She is responsible for all aspects of patient care in a Phase II-IV Cardiopulmonary Rehab Center including exercise prescription, exercise leadership, day-to-day operations, patient education, as well as develop, review and updating policies and procedure, recruitment and training of interns in the area of Exercise Science, and providing educational lectures. Janelle has also worked as a graduate instructor at the University of Arizona, Tucson and participated in research on strength training outcomes for Cardiac Rehab. She received her Bachelor of Arts degree in Physical Education from Creighton University and her Masters of Science degree in Exercise and Sports Sciences from the University of Arizona. Janelle’s professional affiliations include the American Association for Cardiovascular and Pulmonary Rehabilitation (AACVPR) and the American College of Sports Medicine (ACSM). Disclosure: Janelle McCloskey, MS, ACSM-RCEP & CES™ has declared that no conflict of interest, Relevant Financial Relationship or Relevant Non-Financial Relationship exists. The target audience for this course is: entry level Occupational Therapists; entry level Physical Therapists; in the following settings: Rehabilitation Settings.